She’s got it all – wildlife, gems, dinosaurs, stars, natural remedies, and hectares upon hectares of natural beauty. 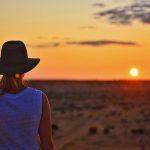 She’ll make you go round in circles – starting in Charleville, through Cunnamulla, Eulo, Thargomindah and onto Eromanga and Quilpie before sending you right back to where you began. Here’s how we recommend spending five days going loco for the Natural Sciences Loop. Your natural sciences adventure begins and ends in Charleville, however getting yourself there is an adventure in itself. 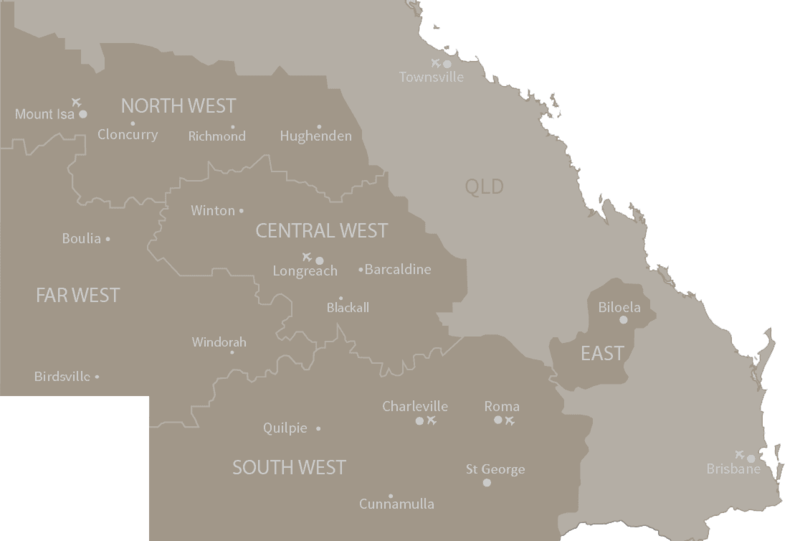 If you’re driving, plan to make a few pitstops along the Warrego Way to break up the 740km you’ll be putting on your tyres from Brisbane. If time’s of the essence, spring for a 2hr flight direct from Brisbane to Charleville via REX Airlines and hire a car at the other end. Or, if you’ve got plenty of time up your sleeve, take the scenic route of the Outback on Queensland Rail’s Westlander. Stay on theme with a night at The Rocks Motel – where luxe city vibes meet outback practicality to create the sophisticated 20-room motel. Kick off your natural sciences adventure with a visit to the adorable but almost extinct Bilby at the Charleville Bilby Experience run by the Save the Bilby Fund. Explore their natural habitat and get up close with these cute creatures with a daily tour and show. The profits from the wildlife centre go towards looking after bilbies and ensuring conservation of the species, meaning you get to both meet and help the miniature marsupials. After dinner at your digs (On the Rocks restaurant), head to the Charleville Cosmos and Observatory for a star-studded show. Each night the centre rolls back its roof to reveal a starry sky waiting to be explored with Meade telescopes. Take advantage of the lack of city lights and get a closer look at the mysterious milky ways, galaxies, planets and the moon. Hit the road for the first leg of the loop – 206km (2hrs) south from Charleville to Cunnamulla along the Matilda Way. 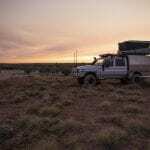 Play spotto on your way to the town that has the largest population of roo’s and wallabies in Outback Queensland. Slim Dusty fans, here’s looking at you – stop by the giant Cunnamulla Fella statue that represents the iconic outback character the musician refers to in his song Cunnamulla Fella. Soak up the history of the Great Artesian Basin which flows beneath the town and one fifth of Australian soil. Step back through time at the Artesian Time Tunnel at the Cunnamulla Fella Visitor Information Centre and learn about the importance of the artesian water in the outback. 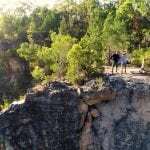 Starting off with a descent into the ancient sandstone rock via an old mining lift, the tour takes you through the tunnel that displays the basin’s history, ancient animals, and an old opal mine. Spend the afternoon strolling the River Walk along the Warrego River or explore the six-hectare bushlands that displays local flora and fauna. It’s worth the 16km detour from town to the Bowra Sanctuary, where avid bird watchers can sit and spot one of the 200 species of native Australian birdlife that call this paradise home. A quick 50-minute drive west along the Adventure Way you’ll arrive into Eulo. You’ll be ripe for a mid-trip pamper session at the Eulo Artesian Mud Baths, especially considering it utilizes the healing property of the land in its treatments. A 90 minute session is all you need to fulfil your dreams of bathing with an incredible view – this spa provides tub time with a twist – it’s completely outside. Enjoy the fresh air as you soak in mud rich with natural minerals including zinc, iron, magnesium, potassium, calcium, and silica. Pssst – know your cat from your cobra pose? 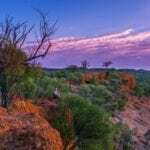 Check out this wellness guide to Outback Queensland. After a rejuvenating rest, continue on to Thargomindah,1.5 hours further west. Here you’ll find more kangaroos than people, the gateway to two of Queensland’s neighbouring states, the Bulloo River, one helluva tree, and one powerful town. Perched on the northern bank of Coopers Creek, the ‘Dig Tree’ is a 200-250 year old coolibah tree that pioneering partners Burke and Wills chose to dig beneath and bury provisions. Instructions to dig were carved into the trunk of the tree and you can still see them today. Take a tour of the town’s claim to fame – the Hydro Power Plant, which houses Australia’s first (and world’s third behind Paris and London) hydro-electricity system. In 1893 Thargomindah streets were lit up by a generator driven by the natural water pressure of the local Artesian bore. Today begins with approximately 3 hours covering 285km of bitumen between Thargomindah and Eromanga. Spend the afternoon getting to know “Cooper”, a 95-98-million-year-old Titanodaur that also goes by the moniker Australia’s largest dinosaur”. You can find him at the Eromanga Natural History Museum, which houses an impressive dinosaur fossil collection from the tiniest traces to giants like Cooper. Not only does it display dinos, the museum has some of the world’s largest megafauna and a variety of microfauna that are thought to be 50,000 to 100,000 years old. If you’re looking for a guide, take the Australian Giants Tour (running four time a day) or get into the thick of it with a dig or fossil prep experience. You can even stay close to the action with a night at Cooper’s Country Lodge, the onsite accommodation. Pssst – Dying for more dinos? You can find out where across Outback Queensland you’ll encounter the prehistoric greats here. Rise and shine for the last leg of the loop – the 3.5 hour drive back to Charleville. Break up the trip and stop in at Quilpie, 75 minutes into your drive. Shining bright as the home of the ‘Jewel of the Outback’ Quilpie is your one-stop-shop for everything opal. Try fossicking a gem for yourself, purchase a few to take home from the opal shops, or head to St Finbarr’s Opal Alter for a magnificent sight of opal used in the church. Can’t get enough of the Natural Sciences Loop? Have you followed the Natural Sciences Loop? What did you see along the way?